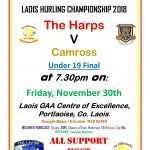 The Harps Junior hurlers got their first win of their league campaign last night with a six point win over Camross. 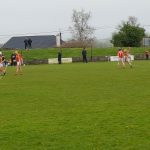 Played in Durrow with a strong wind blowing towards the town end, it was a storming first half performance from our hurlers that set them up for the win. Playing into the stiff wind, The Harps set the tone from the very start, tearing into tackles and hunting in packs. Early scores from Conor Deegan (f), Ross Young and Conor Brophy established an early lead. The Harps were then dealt a blow as Conor Deegan could not continue due to injury, but The Harps were determined to power on as a strong run by Niall Brophy drew a foul which Ross Young converted. Camross hit back with a brace of scores of their own but another great run, this time by Brian Farrell, drew another free and again Young made no mistake. At half time The Harps had a deserved lead on a score line of The Harps 0-06 Camross 0-03. Even with the wind now at their backs, The Harps knew Camross would never throw in the towel and so it proved for the second 30 minutes. Early scores by Young, Maher and a brace by Brian Farrell maintained The Harps momentum, and while Camross threatened at the other end The Harps defence were outstanding, repelling attack after attack. Further frees and a brace from play by Ross Young pushed the gap to six points with five minutes remaining. Camross were desperate for a goal and went the direct route numerous times with long ball into the square, but The Harps defence were in a mean mood and defended superbly. With time almost up the sides traded a converted free each to leave the final scoreline as The Harps 0-12 Camross 0-06. This was a very encouraging performance by the Juniors, and if this level of effort is kept up they will prove to be a hard team to beat. 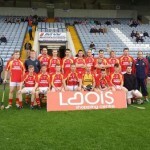 1.Peter Walsh; 2.Sean Cahill; 3.Tommy Moore; 4.Shane Brophy; 5.Conor Brophy; 6.Dan Delahunty; 7.Shane Fitzpatrick; 8.Darren Maher; 9.Rory Moore; 10.Niall Brophy; 11.Brian Farrell; 12.Ross Young; 13.Justin Brophy; 14.John Dunne; 15.Conor Deegan. Subs: Brian Clancy for Conor Deegan (inj).